Good Lovelies are a band that do not rush, and like to evolve at their own pace. Four main studio albums since their formation in 2006 is testament to this Canadian trio having to deal with what life throws at them rather than empty barrels of stimulation. A take it easy strategy has also stretched to rolling out their latest album. SHAPESHIFTERS had its Canadian launch last year, and after a short breathing space, focus switches to Europe and a physical release to coincide with a tour. It is always more productive to promote an album live and personal, and the new record has plenty of nuances that will enhance a Good Lovelies show. Ultimately, the success of a record depends on a broader appeal and SHAPESHIFTERS continues an exploration away from a traditional roots sound that tended to define the music of Caroline Brooks, Kerri Ough and Sue Passmore when they first came to prominence on the international stage. Perhaps there was always a genre-free streak to the Good Lovelies to the extent that the new record remains homeless when categorising is attempted, unless you subscribe to the simplistic theory that music is either good or bad. It is impossible for the Good Lovelies to fall into the latter category and repeated plays of this relative short (32 minutes) record re-enforces this view. The term ‘pop’ was mulled over when attempting to grasp the destination of this album, but it has little desire to court mass market-appeal on concessional terms. This album and its box of tricks effect, scores highly on the innovative scale as the band attempts to widen the canvas of which they supplant their considerable musical skills. Delectable harmonies roam free and spread liberally across the ten tracks, while the sonic landscape subtly mixes the old and the new in terms of instrumentation. For those drawn to the Good Lovelies on the back of their first two records, the pleasurable tones of the closing track, ‘This Little Heart’, inject a dose of familiarity as an unaccompanied start eases into a banjo infused gently rolling sound, all bound by those ubiquitous harmonies. Dedicated and intensive listens to the record eventually anoint three tracks to cement the appeal. Opening number ‘I See Gold’ obviously had designs to be the focal piece and truly delivers on this point with its manoeuvres and switches. 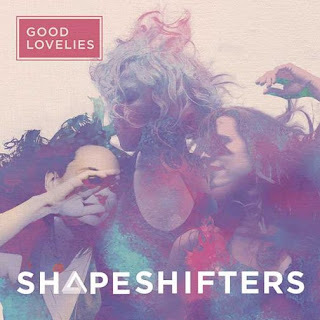 It also houses the album title in the line ‘we are the shapeshifters’, with its mythical change definition almost proving metaphorical to this being the next stage of the Good Lovelies evolution. As engaging as the opener is, it is eventually trumped by ‘When We Were Young’, a gem of a track at the heart of the album. A sumptuous effort blending in shades of late 60s psychedelia. Concluding this mini trio is the vocally strong ‘Daylight’, epitomising the exchange of the lead role and why the Good Lovelies have often proved a cohesive trio born to make music together. Adjusting to the alternative beat of ‘Take Me, Take Me’ in second place in the track listing ensured that grasping the essence of SHAPESHIFTERS did not come instantly. Also after multiple plays, ‘I Had a Dream’ struggles to make an effect. When the record finally sunk in as a valuable addition to the Good Lovelies collection, ‘Move Away Clouds’ probably acted as the pulse of the album. In the latter plays of the review period, ‘Pulse & Fiction’, with a slightly detectable ‘do wop’ start, gained traction, while the penultimate song, ‘Hurry Up’ eventually became the moment when you started to feel the Good Lovelies of yester year. Faint sound of kids on the last track, coupled with a lullaby feel, put the family gloss on something that is very dear to the heart of the band. Undeniably, the goodwill built up of being a Good Lovelies fan for over a decade played a part in giving SHAPESHIFTERS the space to make its presence. On this occasion, time delivered the rewards and this well-crafted album settled into its intended spot. Oh and those harmonies never cease to amaze.